The strange title of this Strugatsky novel perfectly reflects the strangeness that follows. 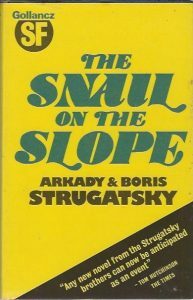 How does one even begin to review a book like The Snail on the Slope (Улитка на склоне), in which reality itself is constantly being called into question, nothing is as it seems, and we’re not even sure if the action is taking place on this or a different planet/universe/etc. ? Well, I’ll give it a try. Of course, the Strugatsky brothers are well-known to anyone who’s taken an interest in Soviet speculative fiction. I may be wrong, but I think they’re the most-translated Soviet sf writers available in the U.S. And for good reason, given the breadth and scope of their oeuvre. Snail itself was born from the merging of two separate stories: “Kandid” (1966) and “Pepper” (1968). In novel form, these stories take turns, with every other chapter being told from Kandid’s perspective, and the others from Pepper’s. While both men are trapped in a kind of nightmarish informational void and suffer from what the introduction’s author (Darko Suvin) calls a “yearning for understanding” (from an untranslatable Russian idiom), the men have diametrically opposed perspectives on the “alien” space that is at the heart of the book: the Forest. While Kandid lives in a village full of barely-conscious people eking out a living surrounded by the terrors of the Forest, Pepper views the Forest from the vantage point of the Directorate, a bureaucratic machine seemingly run on the principle that bureaucracies must be kept running. What exactly the Directorate is supposed to do and why are never fully answered. There’s a department dedicated to Eradication (of the Forest and its inhabitants?) but no one from the Directorate ever seems to actually enter the Forest. Kandid has random flashbacks of falling out of a helicopter, suggesting that, at one point, he too was part of the Directorate and was studying the alien area before (literally) falling into its trap. When Kandid attempts to travel through the Forest to find The City (no one really knows where or what it is), he and his wife are confronted by creatures called “deadlings,” which seem to be composed of living vegetable matter but able to transform themselves into humanoid shapes. Apparently, these deadlings only target women from the village and drag them off to no one knows where (unless it’s that lake filled with drowned women that Kandid later finds…). But then, women Kandid has never met emerge from the Forest and seem to have power over the deadlings, ordering them to transform and do various tasks, leaving Kandid stunned. Pepper, for his part, keeps trying to leave the Directorate and Forest completely, but winds up not only back at the main building, but thrust into the seat of power, tasked with administering something that he doesn’t even understand. The Forest is to be taken as a symbol of the unknown and the alien, a symbol of necessity simplified, of all that is at present hidden from mankind because of our incomplete scientific, philosophical and sociological knowledge. Like Kandid being drawn ever further into the Forest, the reader is drawn into Snail despite its obscurity and unclear storyline, likely because the Strugatskys have mastered the style of creeping, destabilizing horror mixed with the absurd.